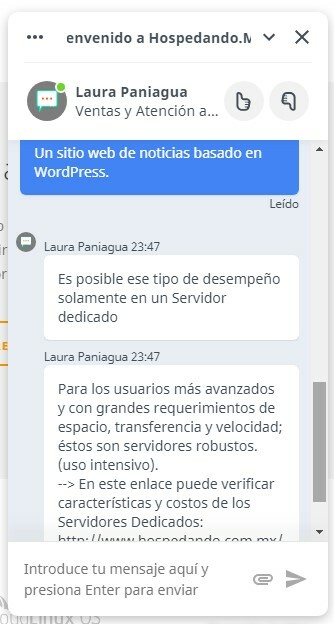 Hospedando Review 2019: Is Hospedando a Good Hosting? Hospedando is a web hosting company based in Mexico. Established in 1999, the vendor offers an array of hosting solutions including shared web hosting, virtual private server solutions, reseller hosting, dedicated servers, and email marketing services. Hospedando is a Mexico-based web hosting provider offering a number of hosting solutions including shared web hosting, VPS, dedicated servers, reseller hosting, and domain name registration services, among others. The hosting firm was founded in 1999. It has a world-class data center located in Lansing, MI in the U.S. The data center provides the backbone through which this hosting provider offers its hosting solutions targeting business enterprises in Mexico and beyond. The Hospedando website is only available in Spanish. Hospedando servers are housed in a highly secured data center connected to multiple fiber optic cables powered by some of the world’s leading suppliers including AT&T, Savvis, Verizon, Sprint, and Level3. This provides diversity and redundancy for fast and reliable hosting services. Hospedando promises to make backup copies of its clients’ website data. However, the vendor maintains that it is not responsible for the loss or accidental deletion of the data. In addition, these data backup services are limited to 3GB of space. The firm’s hosting solutions use CloudLinux operating system which enhances server density and security by isolating each user and supplying their website with the server resources it has been allocated. Hospendado says that it reserves the right to terminate or suspend any client’s account at any time without reason or notice. Hospedando’s hosting plans are competitively priced, aligning with the hosting rates of other vendors of its caliber in Mexico. The hosting provider offers free Let’s Encrypt SSL certificates, a free domain, and free hosting. For every dedicated server plan purchased, the vendor offers a free IP address. Hospedando’s billing cycles are quite inflexible; customers are required to commit to long contracts of a year or more. The prices of the vendor’s hosting plans are listed in Mexican pesos. The firm has no money-back guarantee but offers an uptime guarantee of 99.9%. Hospedando’s technical support team works 24/7. You can reach out to them via telephone, live chat, and ticketing system. They have no email support. Support staff is excellent and polite with a fast response time. What’s more, if you have an issue that you need them to take you through step-by-step, the team will be more than glad to do so. I conversed with one of the vendor’s support reps and got all the information I sought in a matter of minutes. Hospedando has a detailed knowledge base on its website as well. Hospedando’s hosting solutions are designed to meet the needs of small, medium, and large sized businesses in Mexico. The vendor’s affordable hosting plans coupled with a highly responsive support team have endeared them to many webmasters in Mexico and beyond. Wondering how Hospedando stacks up against other Web Hosting companies? Enter any other Web Hosting company and we will give you a side-by-side comparison.